Sierra's Model 240V In-line Volumetric Vortex Meter provides a direct reading of volumetric flow for liquids, steam or constant density gases. Product accuracy is ± 1% of rate for liquids and 0.7% of rate for gases and steam over a 30:1 range. The Model 220 is hazardous area approved for FM, CSA, ATEX and CE and available in flow body sizes from 1/4-inch up to 8-inches. Product accuracy is ± 1% of rate for liquids and 1.5% of rate for gases and steam over a 30:1 range. The Model 240 is hazardous area approved by FM, CSA, and CE. In-line sizes from 1/4 " to 8"
Digital communications solutions include: BACnet, HART, and Modbus RTU. The Model 240V allows for a constant density input to calculate mass flow for incompressible fluids or constant density gas or steam flow. The product features loop power, simple installation with ANSI flanges and a 4-20 loop output. A separate totalizer pulse output is also standard. Smart electronics provides access to all measured variables and programming menus. Our digital communications solutions offer engineers and systems integrators, full industrial system integration and networking capability with Sierra's vortex flow meters. Digital communications solutions include: BACnet, HART, and Modbus RTU. This flexibility of communication features offers turnkey solutions for integration of Sierra's vortex flow meters into any industrial automation system or application. The sophisticated on-board flow computer also incorporates AGA-8 algorithms for natural gas measurement to reduce billing and contract disputes. Smart electronics provide access to all measured variables and programming menus, and permit field-configuration directly from the control panel or workstation via RS485, MODBUS HART, BACnet protocols. 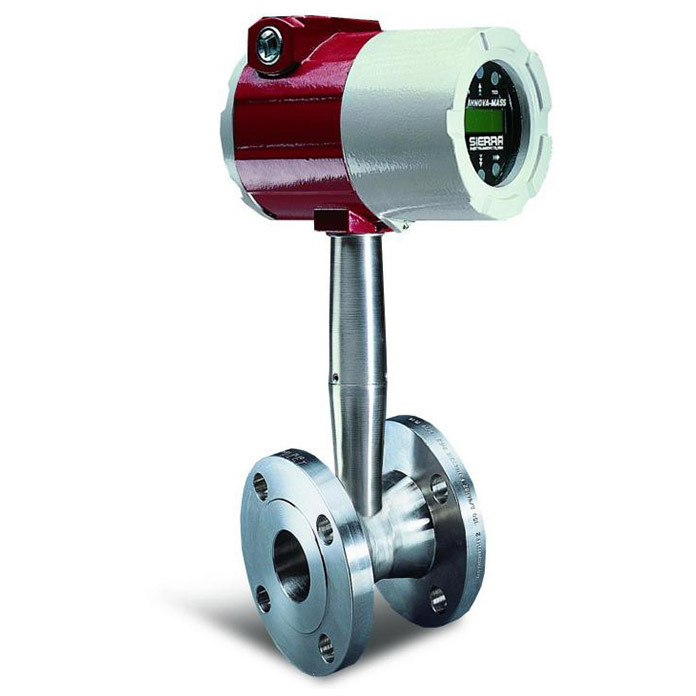 Sierra’s 240/241 Series multivariable vortex mass flow meters use a unique sensor head to monitor mass flow rate by directly measuring three variables–fluid velocity, temperature and pressure. The built-in flow computer calculates the mass flow rate and volumetric flow rate based on these three direct measurements. The velocity, temperature and pressure sensing head is built into the vortex meter’s flow body. To measure fluid velocity, the flow meter incorporates a bluff body (shedder bar) in the flow stream and measures the frequency of vortices created by the shedder bar. Temperature is measured using a platinum resistance temperature detector (PRTD). Pressure measurement is achieved using a solidstate pressure transducer. All three elements are combined into an integrated sensor head assembly located downstream of the shedder bar within the flow body.